Seville Airport provides a VIP room for passengers who are in transit or waiting for their flight, with a wide range of services designed to make the waiting more comfortable. The VIP lounge is located within the Boarding area, so its use is reserved exclusively for passengers of the airport. The VIP lounge is an ideal space to enjoy while you are waiting for your flight, with all kinds of services and amenities. The passenger owns a First Class, Preferred Class or Business Class airline ticket, and the airline has an agreement with that Vip lounge. The passenger owns an AMERICAN EXPRESS, DINERS CLUB etc. VIP credit cards or GOLD or SILVER frequent flyer passengers of eligible airline companies, as well as Priority Pass (access to over 1000 airports lounges), enjoy free access to the VIP lounges in some cases even with an accompanying person. Passengers are also allowed to enter VIP lounges by paying the ticket access in the same reception area. Access to the VIP lounges is subject to rules established by every Lounge, and the stay in it may be limited in time or its access denied by full capacity. Vip lounge for passengers with Schengen and non-Schengen flights. Restricted access to passengers with VIP lounges pass, business class ticket holders, or other passengers upon payment. Passengers can enjoy the following services: catering service, Internet, fax, photocopies, cloakroom, television hairdressing and massage (upon request), work area, press and personalized information about your flight, among other services, in a comfortable waiting area of 288 m/2 surface area. Any passenger with a�Priority Pass is invited to enjoy this lounge. Business hours: from 6.00am to 10.00pm. 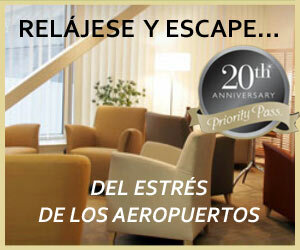 Obtain additional information about Vip lounges at Spanish Airports and their services in aeropuertosenred.com. If you think that the treatment received in any of the lounges has not been the adequate, please refer to the section about claims and complaints at aeropuertosenred.com.